Why is Getting Skinny So Hard? Or so, Aubrey thought. Healthy hopes habitually crumbled into misery. Empty promise after empty promise, the fitness industry routinely burned her. Destined for another failed attempt, a disillusioned Aubrey hears of the talented Mr. Skinny. He holds the secret to her success. He's smart, fit, charming and…too busy for her. She needs to get in shape, she needs to find a man, and she needs to make this year, her year. In this audiobook, Tony reveals the secrets to his amazing fitness program. You'll learn the foundation for his proven MAD Plan. For Tony, it's personal—people need to know that weight-loss isn't hard, it's actually, surprisingly simple. A Certified NASM Master Trainer who lives each moment with passion. He has been immersed in fitness his entire life. Tony helped hundreds of clients lose thousands of pounds, with an incredible 90% client success rate. But his true magic is the ability to explain fitness in simple, relatable terms. Tony has six certifications from the National Academy of Sports Medicine (NASM) and holds two degrees, Engineering and Economics. ©2015 Total Body Project, Inc. (P)2016 Total Body Project, Inc. This book made me feel like I was reading my life story! I am 36 years old and up until the age 18 was over weight. Ive never gone back to being obese but have been on a yoyo diet roller coaster struggling to keep the weight off for good. The majority of my years have been taking diet pills to help with my over eating. After reading this book I am motivated to try again and do it right. The book is easy to stick with and not a bunch of boring facts. The writer draws you in and motivates you though the story. Outstanding and insightful information provided by the author. Easy to follow and motivational. A great source to help you attain your fitness goals. A must read! So easy to read and absorb. Fitness knowledge broken down in approachable, friendly terms without the need to try to sell you products you don't need in the quest for fitness. If you could sum up Get Me Skinny in three words, what would they be? The narrative makes it very easy to understand the basic concepts if nutrition and exercise, and their importance . The author really does a great job of breaking down the weight loss process. His analogies take a simplistic approach to understanding weight loss. The MAD Plan is a great tool for people looking to lose weight AND keep it off. Aubrey because I see so much of myself in her. I have used the same excuses in the past when I struggled to stick to my fitness goals. And I now use the great analogies presented in this book to keep me focused and on track. Simple to understand and incorporate! Yes! I put it on while driving to work, and did not want to turn off the car. It really spoke to me about taking responsibility and how to move forward and create the best version of myself! Highly recommended to anyone who has struggled to lose weight by trying so many diets out there. This book helped me remove the noise and really put something in place that allowed me to stay committed and know how to not fall into the same traps I was used to! You won't be disappointed! Definitely, I can relate to almost every character in the book. At times I felt that I was the main character and the author was speaking directly to me. Most of the information in this book we have heard, but the way that the author presents the weight loss concepts makes it far easier to remember. Full of real life analogies that can be put into practice very easily. When Aubrey meets the accountant. I never thought about how we as people are held accountable with our taxes because there is a deadline, yet we don't hold ourselves accountable to deadlines for exercise and weight loss. Finding an accountability partner is crucial to success. Yes! It was such a quick listen because the story flows smoothly. You are genuinely interested in what happens to Aubrey, but the tribulations and successes. Great read to understand the basic concepts of weight loss and how to navigate through all the junk information that is out there about diets and exercise. What did you love best about Get Me Skinny? The information from this book was so great because it showed me ways on how to stay committed to making changes in my life. I would always struggle staying on track while at work with all the birthday celebrations and food runs. But now I have several tips on how to focus while not rocking the boat with my peers. 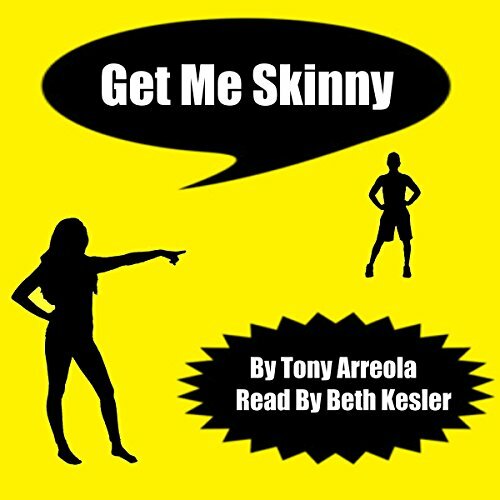 Would you consider the audio edition of Get Me Skinny to be better than the print version? The audio version of the book is more fun. The different characters make learning the material easier. Aubrey is like all of us. She wants to lose weight and has failed many times. Fitness can be simple. This is an easy yet powerful book, and a must read for anyone who wants to stop failing at eating healthy. "Get Me Skinny" is the real deal. It breaks through all the conflicting information out there about weight loss and fitness and puts into real terms the "how-to" for successful weight loss and maintenance. This is a no-nonsense approach to what seems to be a complicated subject. I kept thinking, "Can it really be that easy?" The answer is "yes, it can." This is a book I will listen to over and over again as I need new motivation, dedication, and accountability. Anytime I need my fire lit again, I'll come back to this book. I genuinely believe that this is a groundbreaking way of approaching weight loss. I've found success with the principles in this book. It's changed the way I approach food and choices every day and I'll never look back.